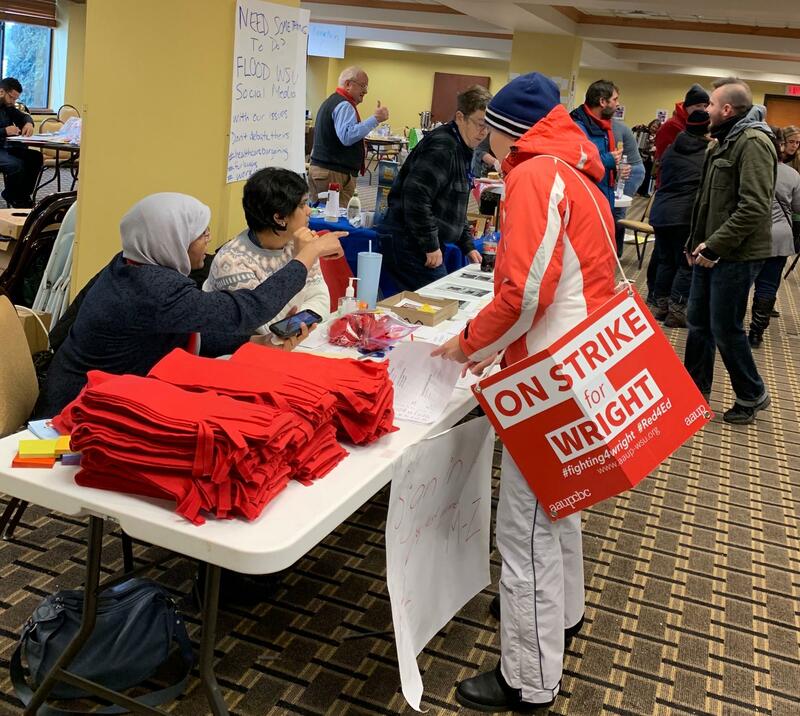 With no deal in sight, Wright State’s faculty union is on the picket lines for a fourth day Friday With temperatures hovering in the teens, union members have turned a conference room in a hotel across from the main campus into their strike headquarters. WYSO’s April Laissle got an inside look at the space on Thursday, and talked to one union member about what it’s been like on the picket lines. If you stick around long enough at American Association of University Professor strike headquarters, you’re guaranteed to hear cheering at least once. 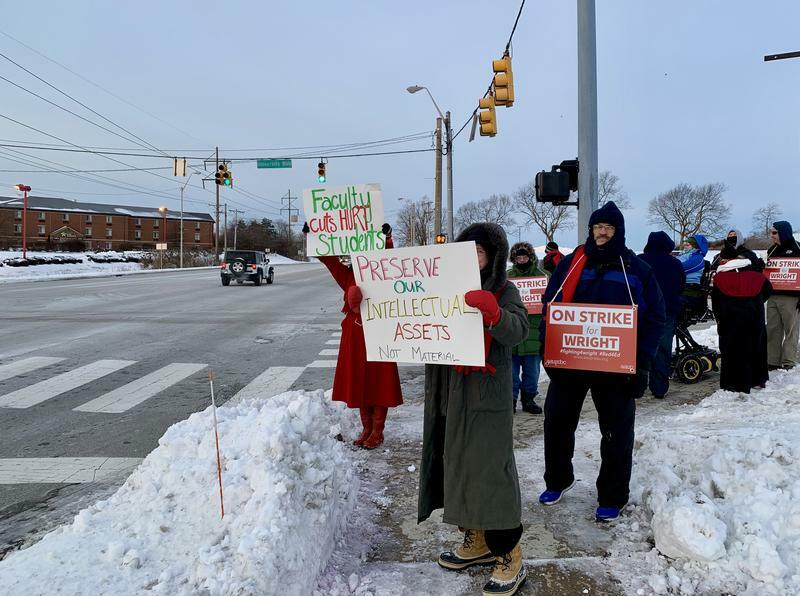 Faculty members become cheerleaders when their colleagues return from shifts on the picket lines. 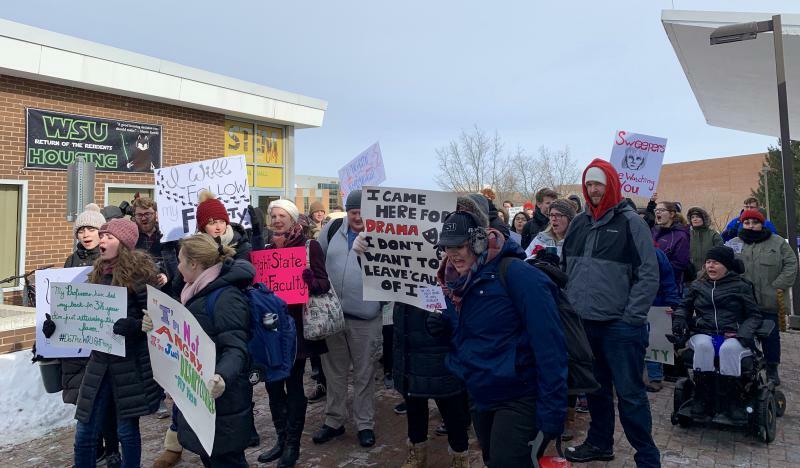 “You’ve got to keep people’s spirits up, right?,” says Sirisha Naidu, a union member and economics professor at Wright State. Over the past few days, she says strikers have transformed this austere Wingate Hotel conference room into a home base. Round tables scattered throughout the room are being used as strike prep stations. Hand warmers and noisemakers sit on one table. Atop another there are poster boards and markers for making signs. “We have on-strike signs, which is what most people are wearing because it’s too cold and you can put your hands in your pocket,” she says. And then, there’s the food. It’s everywhere -- crammed into corners and in boxes, in slow-cookers and casserole dishes. Griddles are plugged into a few power outlets. A graduate student says they’re making grilled cheese sandwiches for their striking professors. Much of the food here has been donated, Naidu says. Students, churches and other community groups have dropped off coffee and hot meals every day of the strike. Back outside on the picket line, Naidu tells me organizing the strike isn't an easy task. “The first couple of days have been intense, trying to figure out the logistics of this because we’ve never done this before: setting up all the tents, arranging transport,” she says. Every morning around 6:30 a.m., a small crew sets up tents on the picket lines. Then, because faculty members can’t park on campus during the strike, a transport team is dispatched to pick them up at parking lots farther away. Picketers sign up for three-hour shifts, but Naidu says many of them stay on site much longer than that. Several days into the strike, there’s still no deal on the horizon. Union officials say no official contract negotiating sessions have been scheduled. Naidu says at times this week it’s been hard for union members to stay upbeat. “Alot of a lot of people are very concerned about health care about money. And yet we're out here in the cold, we're out here striking, we're out here on the picket lines because it's important," says Naidu. "We're all taking a short-term hit but we're doing this because the longterm costs of this imposed contract are too severe." Both the union and the administration have filed unfair labor practice charges with the State Employment Relations Board (SERB), alleging bad faith bargaining, among other things. 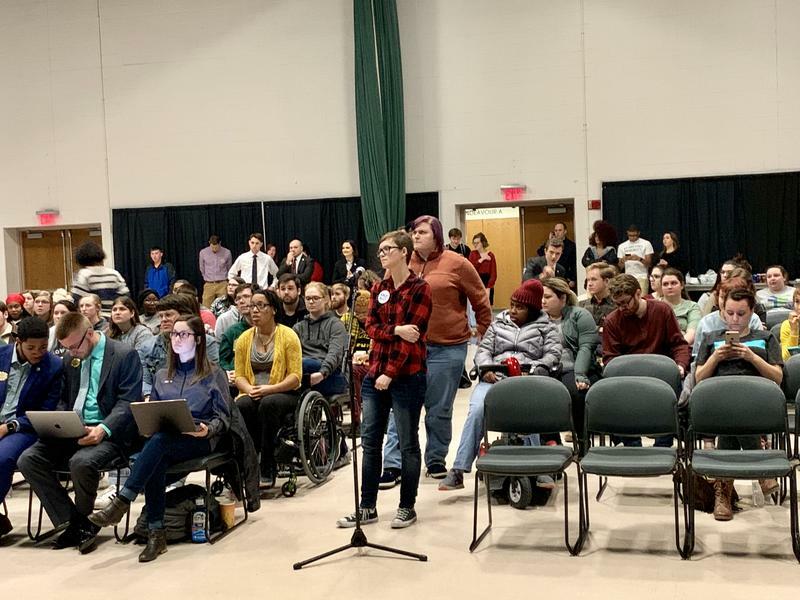 As the strike drags on, Wright State officials say they’re working to mitigate disruption to campus life for students. Union officials say they’ll walk the picket lines every weekday from 8 a.m. to 6 p.m. until they reach a contract deal.